I want to bring your attention to an important book that is being published by MA Books and written by José Gracia Pont and Eduardo Serradilla Sanchis, Los Cómics de las Galaxias. La Era Marvel (1977-1986). Eduardo Serradilla Sanchis follows this blog and is an avid Star Wars comic fan. 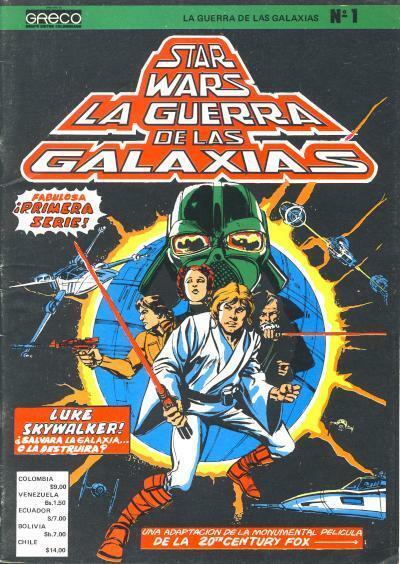 His and José Gracia Pont's devotion to the hobby prompted them to write this book detailing Star Wars comics published around the world during the period of 1977 to 1986. To me, this is a book all fans of Star Wars comics have been asking for and I'm excited about it's existence. To pre-order a copy, send email to mabooks18@gmail.com. Additional information can be found on the MA Books Facebook page. The book Los Cómics de las Galaxias. La Era Marvel (1977-1986) focuses on the process which took George Lucas’s first galactic film to land in Marvel Comics. Added to that the book ponders on the different graphic adaptations of the movies which were published all around the world as well as the development of the so-called “Expanded Universe”. Full-colour book. 286 pages. Paperback. Limited edition of 600 copies signed by the authors. "Remember, absence makes the heart grow fonder." "Or forgetful..."
I apologize for the long absence. This has been happening quite a bit since late last year. In October, my mom passed away, and honestly, my heart was not into posting and I believe many of my posts around that period show it. Then in February, I was promoted at work which has kept me pretty busy. I feel like I'm at a point where I can get back to more frequent postings. I cannot promise there will be no more lengthy absences, but I can promise it is not my intent to abandon this blog indefinitely. Now that things have settled down at work, I'm ready to dive back into giving back to this incredible hobby we share. Looking at the site, I miss having the image galleries and I'm going to be devoting some time in the next month to restoring them. If you recall, they went away because of the whole Photobucket fiasco and I could not be happier with Imgur. Of course, while my acquisition of new books has slowed the past 6 months or so, I still have some terrific comics to share. I'm always astonished when a vintage books is discovered I never knew about and I have some cool books to share in the coming months. I appreciate your sticking with this blog.